I just returned from a trip to Tallinn where I completed the paperwork to invest in GuardTime, an electronic archive and log authentication system using cryptographic time stamps. The idea was developed by the founder of the company, Märt Saarepera and his collegues in Estonia when Mart was in Japan. Mart started out as an academic and a researcher, but became an entrepreneur in residence at my company Neoteny back when we were still incubating businesses. At the time, our team thought that the business was too early and passed on the investment and Mart set off on his own with support of his friends and family and some minimal support from myself. Years later, it looks like the market is finally ready for Mart and his product. His idea has also developed from a rather theoretical idea to something they can show and ship. Mart has raised money from a group of investors including the Ambient Sound Investments (ASI) founded and run by some of the Skype founding technical members. Because of securities laws in Estonia, I needed to visit Estonia personally to open an account at a bank there. The banking in Estonia is really advanced, having been built from scratch after the Internet existed already. They use hardware password generators for their online banking and offer more services through the Internet than any other bank I’ve ever seen. Also, because they don’t have a lot of legacy crap like banks in Japan, they are very profitable and lean. Tallinn was a very cool city. It is the capital of Estonia with a population of about 400,000. In many ways it reminds me of Helsinki except smaller and with Skype as the anchor IT global brand instead of Nokia. The old town where I stayed was a beautiful district with the old architecture preserved and the random Russian government buildings scattered around typical of this former USSR region. Embedded in this old-architecture are very nice restaurants, shops and hotels built in the cool super-minimalist style of Nordic Europe that I love so much. I stayed at a hotel called Three Sisters and it was the best small hotel I’ve stayed in recently. Another cool thing about Tallinn was that there was free wifi everywhere. The hotel, railway station, offices and airport all had free wifi. The Internet was faster than in Frankfurt airport, the Frankfurt Sheraton, in fact faster than just about anywhere that I’ve been recently other than my office in Tokyo. I don’t know if it is the Estonian culture or Mart’s community, but everyone I met at GuardTime and Skype seemed happy and smart. There was a buzz of a strong culture and good work being done. I miss think sort of feeling “pure” feeling these days. I’ve uploaded my photos in a Flickr set. Neat post. I have Estonian roots (and, interestingly, Estonian, like Japanese, is also an Altaic language), so it's great to hear the place mentioned in this context, and also great to hear the country is making an name for itself as a technology center. The family comes from Parnu, though, a little town on the Baltic. Nice to see you investing into Estonian start-ups as well Joi. I actually blogged about the Wifi.ee -thing a few years back with great envy that they hadn't managed to do anything like that here in Helsinki. Then again, like you mentioned - they are very advanced in Estonia with regards to the internet. Indeed, everyone in Estonia seems happy - easy to explain, when you know where they were 17 years ago, and where they are now. They also held their first elections this or last year, over the Internet. Trick is, their ID cards have digital signature implemented (like a GSM sim-card), and they can use it for anything - from access to banks, to voting. 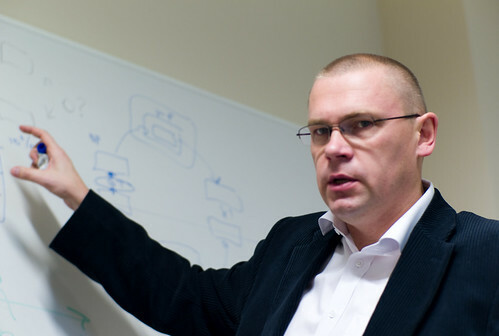 You should meet at some point Ivar Tallo - the guy, who was running the e-Gov academy in Estonia. Audit trail as a web service? Interesting although, having done some work in this area long time ago, it will be a tough business with lots of competitors. Your best friends are legislators. You might also look up Tim Oren who is working data translucency which I think is relevant to privacy and selective processing of audit trail. Hopefully besides Playtech and Skype there will be other success stories in Estonia, that can contribute also to the economic growth of the whole country. Good to hear from Japanese people interested in Estonian new ventures and "Internet culture". Hope to see news from GuardTime, we will most probably do a pilot project with them soon as it could help us to build trust to our compliance service offering. I have to say that I am not happy with the Estonian e-voting scheme. It doesn't have a proper concept of the secrecy of the ballot. It is trivial to sell your vote. Yeah Peeter and Veni, I have heard that in some countries people still vote with pen and paper, even outside Africa. Sounds so strange ! Joi Ito - "Tallinn" by Joi Ito is licensed under a Creative Commons Attribution 4.0 International License.